Take a thrilling off road adventure through Woodhill Forest to the coast of Muriwai Beach on a 4-wheel drive motorbike. A professional guide will provide safety training, gear and will accompany your ride to ensure the best tracks for your level of experience. Explore a variety of trails from flat to challenging steep hills as you travel through the sand-based pine forest. Ride along Muriwai beach and enjoy magnificent views of steep cliffs and gannets. 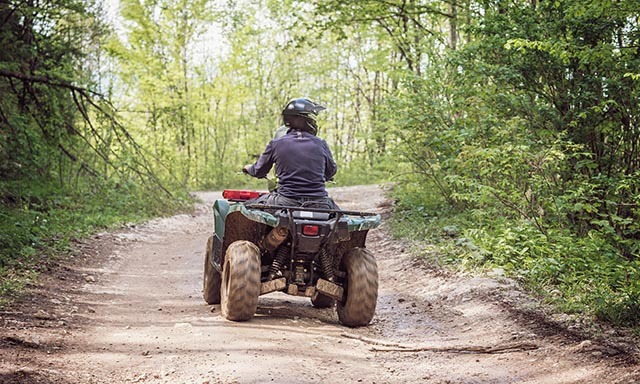 • Hop on a 4Wheel motor bike for an exhilarating adventure in Woodhill Forest. • Drive along the wild surf of beautiful Muriwai Beach. • Keep watch for birds and other wildlife. • Strong, closed-toe footwear such as boots or sneakers is required. • Wet weather gear is provided for the bike safaris in case of rain. • A guide will travel with the group on their own 4WD Quad bike. • Guests will be required to sign a waiver. • A valid driver?s license is required to drive the vehicle.